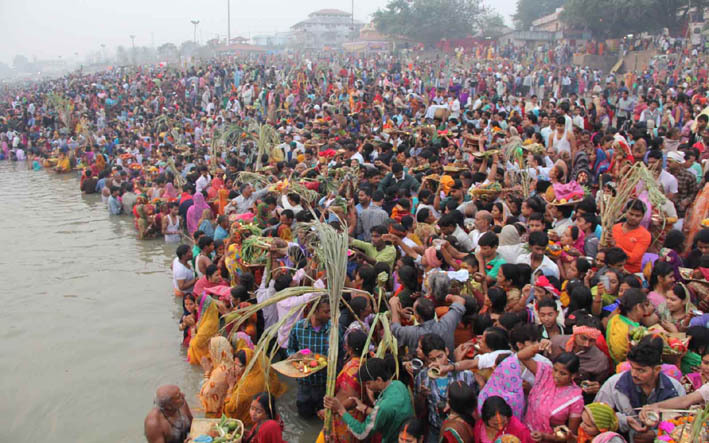 Chhath (छठ-पर्व) – the symbol of piety and reverence !! The very first thought of छठ-पर्व (Chhath Parv) makes me nostalgic. Reminds me of my mother (Maa) who had been observing “Chhath” for last three decades. Maa resides in Jamshedpur (part of erstwhile Bihar, now in Jharkhand) and after much persuasion she has now stopped performing it since last year because she is not in the best of her health. Writing what you have lived all life is much harder than writing a one-off experience. Recalling Maa‘s Chhath Vrat observance primarily for those who are not aware of this most revered and pious festival. It tells highly of our deep-rooted culture and heritage. Although it is observed mostly in Bihar, Jharkhand, Eastern UP and the Tarai regions of Nepal in today’s times, and is more prevalent in areas where migrants from those areas have a presence. Chhath (छठ-पर्व) is an ancient Hindu festival and the only Vedic Festival dedicated to the Hindu God Sun, Surya. It is believed that the ritual of Chhath Puja may even predate the ancient Vedic texts as the Rigveda contains hymns worshiping the Sun God and describes similar rituals. The rituals also find a reference in the epic of Mahabharata in which Draupadi is depicted as observing similar rites. The Chhath-Vrat is performed to thank Surya for sustaining life on earth. The Sun considered the God of energy and the life-force, is worshiped to promote well-being, prosperity and progress. Chhath is a festival of worshipping both the setting sun as well as the rising sun. As per legend, ‘Usha‘ and ‘Pratyusha‘ are both considered to be Sun God’s wives. Usha (literally the first sun-ray of the morning) is worshiped on the final day. Whereas the Pratyusha (the last sunray of the day) is worshiped in the previous evening to the rising and setting sun respectively. It is the only holy festival that has no involvement of any ‘Pandit‘ (priest). 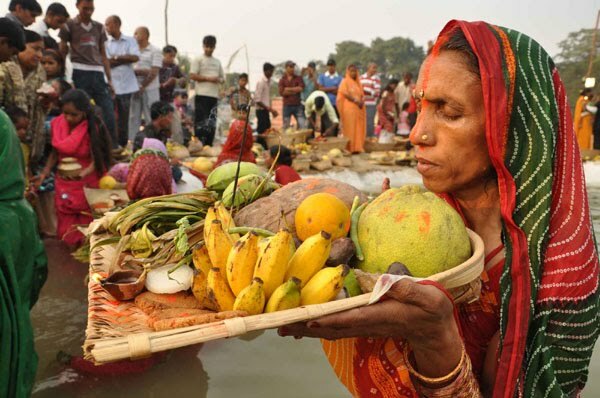 Chhath is performed on Kartika Shukla Shashthi, which is the sixth day of the month Kartika of the Lunar (Nepali Calender) also known as Vikram Sambat. It follows Deepawali by six days. Chhatth word is derived from the sixth day of the month. Some also call it a combination of Chhah (six) and Hatth (abbreviated version of Hathyoga), Chhah + Hath = Chhath. I can believe that. Chhath is probably the toughest festive ritual in all of India. It is an extreme display of religious fervor of the devout. Chhath-Vrat is generally observed by the eldest in the family, and it could be any, a male or a female. Let me brief you how “extreme” this extreme is! Nahaye-Kha ( नहा-खा ): The 3rd day from Deepawali is observed as holy bathing, the Parvaitin (one who observes the parv/puja) takes a holy bath in the morning and then eats rice, gram pulses, and pumpkin vegetables sans onion and garlic. After eating the food sometime mid-noon, the Parvatin (worshipper) starts the waterless-fast (निर्जला-व्रत) which is broken only the next day evening. During this period of three nights and four days, the worshiper observes purity and sleeps on the floor. Since it falls in winter, a bed on rice straws is made by putting a blanket on it. It would be the hot-bed of all activities for the Chhatth puja. Maa’s unstoppable instructions would flow, despite our reminder to take some rest. All the kids of the family would offer massage to the ‘Chhatthi Maiyya“, the Parvatin, and the time would fly singing folk songs. Kharna (खरना ): The next day (Fourth Day) fast is observed whole day without water till late evening when the Prasada is prepared just after the worship of Sun and Moon. This day is called, “Kharna or Lohanda.” I still remember Maa coughing away over the smoky Chulha (cooker) on this day as she tries to stoke the chulha in the Pooja area cooking her repast of Roti and Rasiyaa (Kheer made of rice, cow milk, and jaggery). First the Parvatin eats the Prasada ending the first round of fast of almost 24-30 hours. Then the Prasada is distributed among all family, friends and neighbors. This day the festival preparations would simultaneously start. The “Daura” (big-basket) and several “Soop” (sieve) would be bought. The abundant amount of different types of fruits and rooted vegetables will be obtained, the chief among them being the whole bunch of bananas (Ghawadh), long sticks of sugar cane, coconuts along with their casings, and lots of other items of Pooja. And the separately and freshly ground “atta” (wheat flour) to make the main Pooja offering of “drenched in ghee, Thekua”, kilos and kilos of it. Sandhya Arghya (सांध्य-अरघ्य ): After this again the rigorous ‘nirjala-fast’ starts for next 36 hours. 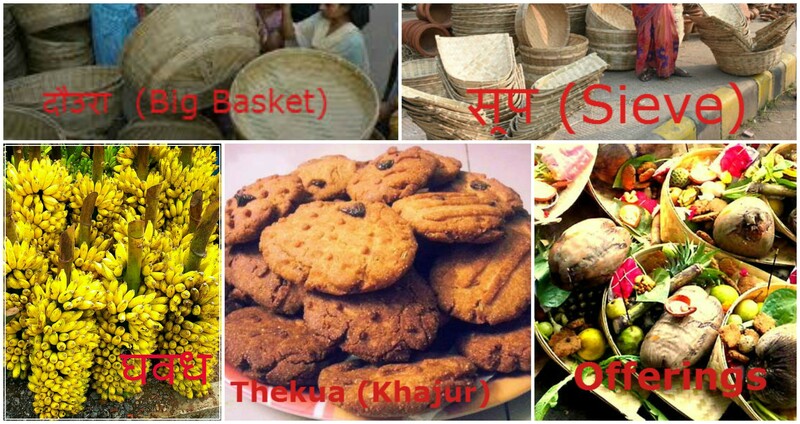 On the fifth day, for the evening offerings or Sandhya Araghya to the setting sun, all the pooja-samaagri and the Prasada arranged in the sieves, would be piled onto the ‘Daura‘ (big-basket). Then all, family, friends and neighbors would be swarming towards the nearby river/pond to pay reverence to the Sun God. The lead ‘walker’, the cynosure of all eyes would be the person carrying the ‘Daura‘ on his head. But it is open to all, and many would eagerly wait for their turn, to do the service. Maa and other Parvatins would walk a little behind them with an amazingly spirited walk despite the hours of fasting. The grown-ups would walk with either the heavy sugar-cane sticks or the banana bunch. At the ghat, the larger groups would split into their small family group, and occupy their patch of the sand-bed. This patch would be zealously marked out to be able to occupy the same spot for the next morning’s rituals. The occasion is almost a carnival. Besides the Parvatins, there are family and friends, onlookers and also numerous other participants, all willing to help. The evening offerings comprised of Maa stepping into the water above knee-deep while others would help her to offer the Arghya. The Arghya is an offering of Gangajal and Cow-Milk and is considered to be nectar (Amrit). She would turn around in the water with the multi-decker ‘Soops’ (sieve) held in her hands. When I say that the rituals of Chhath are arduous, I do not mean only the extreme fasts. As we know Chhath falls in winters, it is tough for the worshipper and other devotees to stand in the chilly waters for hours and offer Araghya. Now the time to return home on our wearied feet. All Parvatins including Maa would show no signs of discomfort, at all. The primary concern for all the kids at home and neighborhood was how to wake up early in the morning! We will be promised, that elders would wake us up, but we were never sure. We would pledge not to sleep and lie down on our beds lest we miss the morning Arghya. But sleep we did! Usha-Araghya (उषा-अरघ्य ): Miraculously, we would wake up just in time to join the morning march to the Ghat. On the final day of Chhath-Puja, the devotees, along with family and friends, go back again to the Ghat much before the dawn for the morning offerings. Occasionally there would be small altercations among the younger people from different families disputing the exact location of the previous evening’s spot. But with prompt intervention from the elders, these were solved without any fuss. Crackers saved from Diwali just a week ago would be burst just as the dawn broke. Some images that remain in my mind are the shooting rockets on the water surface, hoping it will cross the river skiing on it. The sky would still be dark, and millions of Diyaas and fireworks enlighten the ghat. The sight is beyond magical. After the morning Arghya, the fasting for Maa would end with Pitaji giving her ginger, lemon, and water. Prasada is then distributed to all. Normally the Prasada is “Thekua“, different fruits, and among all and my favorite, the long sugar cane. There won’t be a single person on the way back home on the road, who would not be munching ‘Thekua‘. Once a family starts performing Chhatt-Puja, it is their duty to perform it every year and to pass it on to the following generations. The festival is skipped only if there happens to be a death in the family that year. One can read many stories and write-ups, but to understand and feel the piety and elaborated beauty of this festival, one must witness it. Truly, Chhath is the symbol of reverence!! #BeefRaid issue is plain drama. Albert Ekka – Galantry personified ! !